When most people think of arts in New York, theater will come to mind long before videogames do. But recently at the Cherry Lane Theater in the West Village, videogames were a close second. Sameera attends E3, hoping to meet her game idol, a woman described in the first scenes in a way that, perhaps unintentionally, likens her to Jane McGonigal. Her name is Elly, and she takes an immediate interest in Sameera’s idea–and Sameera herself. The fallout from Sameera and Elly’s affair is a central part of the play. 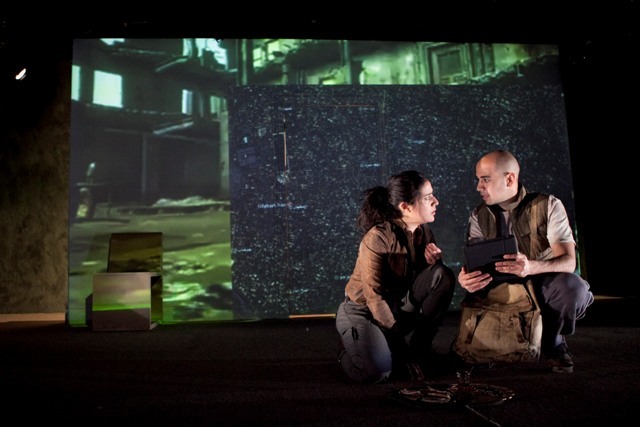 Interwoven with the story of Sameera’s personal and professional lives are scenes of an Iranian boy, apparently a character in Sameera’s game, who appears onstage in what appears to be a war-torn Iran. In his earlier scenes he’s alone, with a multimedia projected background shifting between desert landscapes, high-tech maps, and a plain black-and-white grid pattern that looks like Star Trek‘s holodeck when it’s turned off. These scenes are probably supposed to illustrate the simultaneous creation and existence of Sameera’s game world. Exile is interested in games as a medium for empowerment. But the play isn’t really about videogames–it’s an earnest, thoughtful, yet at times convoluted meditation on identity and creation. Game enthusiasts would probably find a lot to critique — the brief look we get at Exile‘s game mechanics, for example, are a SoulCalibur-like recitation of “up-down-A-B-A” combos that lacks any real discussion of how it integrates with the game’s narrative. Yet Exile took a chance with videogames, and that’s a sight to see in and of itself. Ultimately, Exile’s most compelling question is the one it asks by its mere existence: What does it look like to try to talk about videogames in an analogue medium? Exile can’t provide an answer that question. But it does represent one of the first attempts. The Nastiest Takedown of Videogames Ever?